Islamic TV: A Two-Headed Monster? This image from the Washington Post Day in Photos lies right across the line between soft news and hard news. Although cast as a representative of displaced Iraqis, I doubt the woman will elicit much sympathy. Indeed, the image calls the bluff of the serious captioning: the photo is striking but not for the reason given. As noted several times before in this blog, the burqa troubles the Western gaze whenever it is is placed in modern context. (Within the traditional setting, it confirms ideological assumptions instead of challenging modern norms of transparency.) 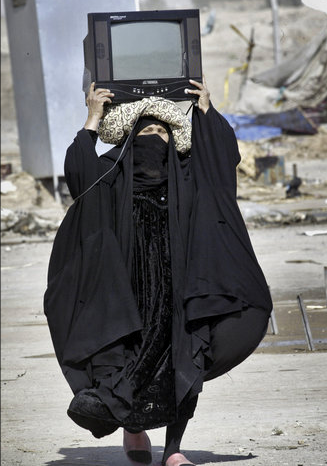 By walking with the TV balanced on her head, the burqa-clad woman becomes a cyborg, both human and machine, organic and artificial, traditional and modern. She now has two heads, one veiled, turbaned, and a platform for the other, which is a blank screen capable of channeling the vast information flows of the modern media. Despite the visual joke, the latent fascination of the image is that she has become monstrous. Not terrifying, but more akin to a freak show. The fact that the photo is half soft news and half hard news reinforces this sense of an unnatural though not too dangerous mixture. Of course, it’s not news at all. We know all about Al-Jazeera, and scholars, not least Martin Marty’s Fundamentalism Project, have documented that fundamentalists of all religions have no problem rejecting modernity’s values while becoming cutting-edge producers and avid consumers of modern media. It turns out that modern liberals are the ones who have a hard time managing that contradiction. Which is why the photograph above, which could be seen in a very ordinary way, instead implies that the two civilizations can never be blended but must instead be joined only precariously, amidst violence. Photograph by Alaa al-Marjani/Associated Press. Worth noting is that we have seen this visual composition involving carrying televisions before in domestic imagery from events such as hurricane Katria, and during the LA riots of the early 1990s. The image always seems to surface in settings characterised by destruction, and television’s presence in such images is usually a comment on the disproportionate value placed on television as a commodity and as entertainment, rather than the resucue or preservation of necessities. The television in America has become a double standard status symbol, an accepted mode of communication for the middle and upper classes and quite literally a diagonal measurent of success, while on the other hand it has become a symbol of moral and educational bankruptcy for the poor. In the Katrina and LA riots images involving televisions, as with the image you have presented, the television is used to in some way marginalize the person carrying it.